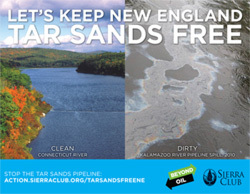 Stop the New England Tar Sands Pipeline ! PLEASE SIGN ! ! Thanks for taking action -- will you join us in Portland, ME on January 26? Thank You for Helping Animals! Thank you for sending a message to your elected officials asking that Big Oil be required to apply for a presidential permit. By taking action you are standing up against tar sands oil in the Northeast. I honestly think if we do not address this as a national issue, nothing good will come from state or regional actions. The federal governments of Canada and the United States must the people and natural resources above the desires of Oil and Gas companies. Signed & noted. It seems as tho Big Oil is coming at America from all sides. With all these pipelines, one could possibly slip thru the cracks and be put in. Thanks for taking action -- will you join us in Portland, ME on January 26? Sorry I am way over the ocean! Only for US but noted Cher, thanks. Can't sign as British but noted and good luck with it!